by Chris Woodford. Last updated: March 19, 2019. Suppose you've just designed a gigantic new passenger airplane and now you want to test it out for real. You could spend millions of dollars building it out of shiny titanium metal and race it down the runway to see if it actually flies—but what if you got your calculations wrong? What if your airplane takes off for twenty seconds, then suddenly drops like a stone and lands on a city packed with 5 million people? It's not the best way for testing something so dangerous. That's why airplane designers try things out on the ground first using scale models in wind tunnels. Let's take a closer look at how they work! 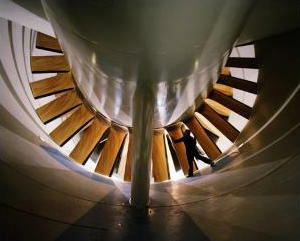 Photo: The fan blades inside one of the giant wind tunnels at NASA Langley Research Center. Note the man inside! Photo by courtesy of NASA on the Commons. Photo: The basic idea: fix the plane on the ground and blow air past it. 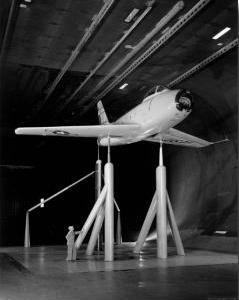 Photo of an F-86 aircraft, mounted in the 40 x 80 foot full-scale wind tunnel at the NACA Ames Aeronautical Laboratory, Moffett Field California, taken in 1954. Note the engineer standing underneath the plane. By courtesy of NASA on the Commons. Designing planes that will fly quickly, efficiently, and economically is all about making air flow smoothly over their wings and past their tube-like bodies. This is called the science of aerodynamics. Once a plane's up in the air, there's no easy way to see how air is moving past it (though an experienced test pilot will have a good idea what might be causing problems). If there's a major design defect, the plane won't get into the air at all. That's why every modern spacecraft and airplane is tested on the ground first in a wind tunnel: a pipe-like building through which air blasts at very high speed. The basic idea of a wind tunnel is simple: if you can't move the plane through the air, why not move the air past the plane instead? From a scientific point of view, it's exactly the same. If a plane drags (causes air resistance) when it soars through the sky, air will drag in exactly the same way when you fire it past a stationary model of the plane on the ground. There's nothing to stop you building a super-giant wind tunnel and testing a life-sized model of your plane—and, indeed, the American space agency NASA does have wind tunnels like this. But most of the time it's much cheaper to use a small, scale model of the plane in a much smaller wind tunnel. Photo: A wind tunnel is like a giant pipe. Note the wide outer sections and the much narrower inner section where the tunnel produces high-speed air in the central test laboratory. Photo of the 16-foot high-speed wind tunnel at the NASA Ames Aeronautical Laboratory, Moffett Field, California, taken in 1948. By courtesy of NASA on the Commons. A wind tunnel is a bit like a huge pipe that wraps around on itself in a circle with a fan in the middle. Switch on the fan and air blows round and round the pipe. Add a little door so you can get in and a test room in the middle and, hey presto, you have a wind tunnel. In practice, it's a bit more sophisticated than that. Instead of being uniformly shaped all the way round, the pipe is wider in some places and much narrower in others. Where the pipe is narrow, the air has to speed up to get through. The narrower the pipe, the faster it has to go. It works just like a bicycle pump, where the air speeds up when you force it out through the narrow nozzle, and like a windy valley where the wind blows much harder, focused by the hills on either side. Having a wind tunnel with narrow sections is an easy way to build up more speed—and speed is something we need lots of. To test a supersonic airplane, you need wind speeds about five times faster than a hurricane. And for testing something like the Space Shuttle, you need to blow your wind round ten times faster still. Some wind! Artwork: A plan view of a typical wind tunnel. Drive motors: These are giant electric motors that spin the fan. Compressor: The fan (or fans) that produce the high-speed wind. Supersonic, high-speed test section: The model airplane is placed in here. Vanes: These are airfoils positioned in the corners to turn the air through 90 degrees without losing energy. 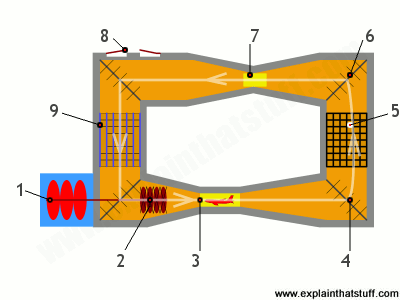 Acoustic muffler: Wind tunnels are noisy places! Mufflers help reduce the noise and more accurately simulate a realistic air flow. Subsonic, low-speed test section: There's a smaller test chamber round the other side where the air moves a bit slower. Access doors: The scientists have to get in somehow! Air dryer: This section removes moisture from the air flow. Photo: Want to do a bit of wind-tunnel testing but can't afford the millions you'll need to spend on all that fancy equipment? No problem: there's an app for it! Search for "wind tunnel" in your favorite app store and you'll find quite a few simulations you can play with on your smartphone or tablet. This is a screen capture I made with a free app called Wind Tunnel Lite, from Algorizk, which lets you test a few basic shapes (like cars and airfoils) at different wind speeds. There's also a pro version that lets you control far more things (propeller thrust, fluid viscosity, friction, and wind speed). Well worth a look for teachers! Air is invisible, so how do you see whether a plane is performing well or badly inside the tunnel? There are three main ways. 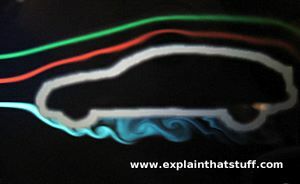 You can use a smoke gun to color the airstream white, then watch how the smoke shifts and swirls as it passes the plane. You can take what's called a Schlieren photograph, which makes variations in the air speed and pressure show up so you can see them. Or you can use anemometers (air-speed measuring instruments) to measure how fast the wind is going at different points around the plane. Armed with your measurements and lots of complex aerodynamic formulas, you can figure out how good or bad your plane is and whether it would really stay up in the sky. Once you're happy, you can build yourself a prototype (a test model) and try it out for real—or persuade someone else to try it out for you. Test pilots earn amazing amounts of money because of the risks they take. But they're an awful lot happier buckling themselves into their seats knowing everything they're about to try has already been tested in a wind tunnel! Although wind tunnels are best known for testing out new planes and space rockets—vehicles that speed through a (theoretically) static airstream—they can also be used in the opposite way: to simulate how fast-moving winds affect static structures, such as high-rise buildings and bridges. Architects and structural engineers need to consider not just the loads that high winds impose on their designs (literally, whether buildings could blow down), but how things like skyscrapers catch the wind and bounce it down to ground level, creating "down-draughts" and potentially dangerous vortices that can blow people off their feet. Problems like this are easy to study—and correct—using realistic models in wind tunnels. Who invented the wind tunnel? Photo: NASA's 1948 design for a supersonic wind tunnel. By courtesy of NASA Ames Research Center. Most people would agree that the Wright brothers pulled off a neat trick when they made the first powered flight in December 1903. Some trick! They'd spent years studying aerodynamics and perfecting the design of their wings, which they called "aeroplanes." While the Wrights made most of their tests outdoors, modern planes are more likely to be tested indoors—thanks to the insight of self-taught British aero engineer Frank Wenham (1824–1908), who invented the wind tunnel in 1871. Unlike huge modern tunnels, Wenham's original had (as he put it himself) "a trunk 12 feet [3.7m] long and 18 inches [46cm] square, to direct the current horizontally, and in parallel course" and the air that whistled around it traveled no faster than 64km/h (40mph). Compare that with the world's largest modern wind tunnel at NASA Ames Research Center, which is over 100 times longer (430m or 1400ft long), has a test section with an overall area measuring 24m × 37m (80ft × 120 ft), and produces winds of up to 185km/h (115mph). Modern wind tunnels like this owe a huge debt to forgotten pioneers such as Wenham, whose insights helped to usher in the modern science of aerodynamics—allowing millions of us to take to the sky every single day! 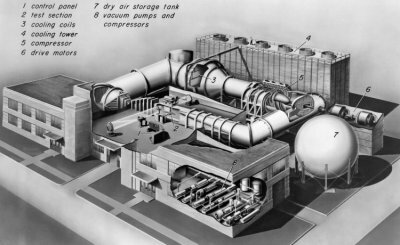 Wind Tunnels of NASA: Chapter 1: Looking for Something Better: NASA's own account of the early history of wind tunnels, and how they evolved from "whirling arms." Beginner's Guide to Wind Tunnels: Comprehensive introductory materials from NASA, including history, testing techniques, aerodynamic theory, and math. Also has a section on how to build your own wind tunnel for schools. October 1960: High speed wind tunnels by Jon Excell. The Engineer, October 15, 2014. A fascinating look at classic, 1960s-era wind-testing facilities near Preston, England. May 27, 1931: Wind Tunnel Lets Airplanes 'Fly' on Ground by Jason Paur. Wired, May 27, 2010. 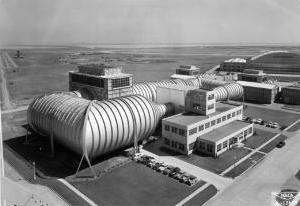 Celebrating the world's first full-scale wind tunnel, which opened at Langley Field near Hampton, Virginia in May 1931. Inside GM's Massive Wind Tunnel by Chuck Squatriglia. Wired, October 16, 2008. What's a wind tunnel really like inside? Here's a fascinating photo tour of a tunnel designed for testing cars. Ultimate Test by Max Glaskin: The Engineer, January 15, 2008. How the motorsports industry uses rolling-road wind tunnels. Struggling in the Wind Tunnel to Keep Its Sound Out by Jim McGraw. The New York Times. October 21, 1998. An old, but interesting (and still relevant) article describing how car makers use wind tunnel tests to reduce the nuisance of wind noise. Wind Tunnels Utilized in New Ways by Walter Tomaszewski. The New York Times, August 30, 1970. An article from the Times archive explains how wind tunnels were used for things like skyscraper design in the late 1960s. One notable pioneer of this work was Jack Cermak of Colorado State University. The 1901 Wright Wind Tunnel: Wright-Brothers.org, undated. A fascinating photographic look at the tunnel the Wrights used for their experiments (the second one in the United States). Low-Speed Wind Tunnel Testing by Jewel B. Barlow, William H. Rae, and Alan Pope. Wiley, 2015. One of the classic textbooks, particularly concerned with automobiles, bridges, and other low-speed applications. Wind Tunnel Testing of High-Rise Buildings by Peter Irwin et al. Routledge, 2013. An introduction to wind testing for architects and structural engineers. Aerodynamics: Selected Topics in the Light of their Historical Development by Theodore Von Kármán. Dover, 2004 (reprinted from 1957 original). A classic review by one of the pioneers of modern aerodynamics. The Illustrated Guide to Aerodynamics by Hubert C. Smith. McGraw-Hill Professional, 1992. A practical guide for pilots. US Patent 1,635,038: Wind tunnel for flight of models by Elisha Fales, July 5, 1927. Fales worked for the US Army Air Service and made important contributions to the science of aerodynamics. In 1918, working with Frank Caldwell, he built the first high-speed (though still subsonic) wind tunnel in the United States to test propeller designs. US Patent 2,152,317: Wind tunnel and method for determining streamline contours by Albert J. Kramer, March 28, 1939. This patent describes the preparation of models for wind-tunnel testing. US Patent 2,677,274: Supersonic wind tunnel apparatus by Allen E. Puckett, May 4, 1954. When airplanes headed toward the sound barrier, so did wind tunnels! This patent describes some of the problems of high-speed wind-tunnel testing and how they can be overcome. US Patent 2,711,648: Wind tunnel model support mechanism by Ralph Carlstrand, Northrop Aircraft, Inc., June 28, 1955. How do you simulate vibrations and flutter in a wind tunnel if your model is stationary? You need a mechanism that can replicate these movements in your model. US Patent 3,111,843: Hypersonic wind tunnel by Raymond Fredette, Cook Electric, Nov 26, 1963. Is there a limit to how fast airplanes can go? Wind tunnels help us find out.